Facebook continues to add options to entice brands. Now, Facebook users will be able to play with a brand’s AR camera effects right in their News Feeds. The ads can also include calls-to-action directly within the camera experience, which is good news for brands with something to sell. Michael Kors was the first brand to test AR ads on Facebook. The ads let fashionistas virtually “try on” sunglasses, and then make a purchase if they like what they see. Financial terms of the ad buy were not disclosed. Facebook plans to add VR ad campaigns from additional brand partners including Sephora later in the summer. Although the effort is experimental, AR is hardly a fringe technology. In the United States alone, more than 80 million consumers now engage with AR on a monthly basis, according to an estimate from The Boston Consulting Group (BCG). By 2021, BCG expects that number to swell to more than 120 million U.S. consumers. Putting a price tag on all that activity, Digi-Capital recently estimated that the AR marketplace -- including mobile and smartglasses -- will be produce between $85 billion to $90 billion in revenue by 2022. Playing catch-up with Snap, Facebook unveiled its AR app marketplace in April. 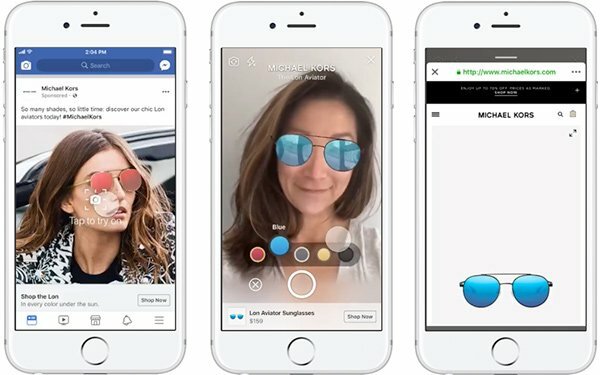 Unlike Snap, however, Facebook’s marketplace is serving as an open platform for AR apps and tools. “Instead of having maybe 10 or 20 options to choose from [with Snapchat], you’re going to have thousands of options from creators all over the world from all different types of cultures and backgrounds and styles,” Facebook CEO Mark Zuckerberg boasted in April. Along with VR, Facebook is encouraging brands to create more mobile video. To do so, the tech titan is readying a Video Creation Kit, which should simplify the video-creation process. The “kit” is still in testing and is expected to begin rolling out in August for ads on Facebook, Instagram, Messenger and Facebook’s Audience Network. Separately, Facebook on Tuesday also said it is testing additional ecommerce features on Instagram. That includes a new ad format that lets users browse additional products with a single tap from the Instagram feed, while staying in the app.